This article is the third and last in a series discussing the grass-fed beef enterprise. The information comes from a presentation made by Bruce Carpenter, livestock specialist with Texas A&M AgriLife Extension, during the May 2017 Grass-Fed Beef Conference at Texas A&M University. Successful cow-calf operators who want to enter the grass-fed market should transition into the new enterprise slowly. 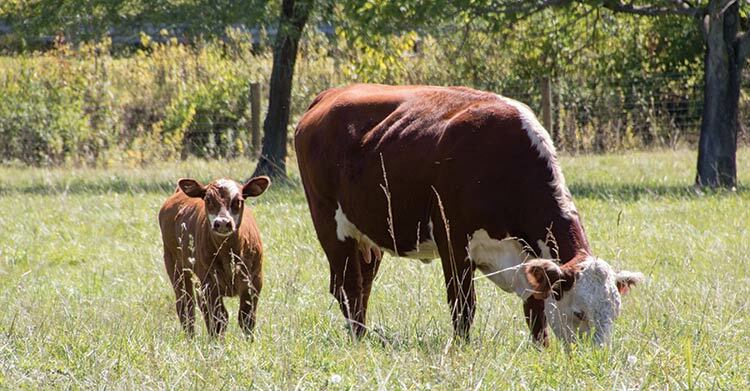 A slow transition can provide an opportunity to learn the new business and work through initial problems, while retaining a portion of the cow-calf operation for calf production. The first item to address prior to initiation of a grass-fed program is the forage management plan. A well-designed forage management plan will maintain enough good-quality forage to support the grass-fed enterprise. Before the enterprise is initiated, determine the number of animals your pastures will support and how animal numbers will be managed. Suggestions for year-round pasture programs were presented in the August 2017 Hay & Forage Grower issue (page 18). Estimated pounds of production from various forage species are available through Natural Resource and Conservation Service (NRCS) conservationists or state extension specialists and are suitable for planning purposes. Once the management plan is implemented, however, it is wise to monitor forage production on a continual basis. There are various methods of estimating forage production, but the simplest and quickest way is to use the NRCS grazing stick. Pete Bauman, South Dakota State University Extension Service, explained the use of the grazing stick in a publication posted on the internet at bit.ly/HFG-stick. “The grazing stick is designed to measure average leaf height of the vegetation in grassland by providing a simple yardstick style ruler on one side,” Bauman said. “To accurately determine overall forage availability with the grazing stick, measure leaf height in the upright position. You may need to hold trampled grass in a vertical position in order to get an accurate leaf measurement. Stems and seedheads are not included in the measurements. Take measurements at no less than 15 to 20 locations within a grassland area and select plants that are a fair representation of the overall vegetation complex,” he added. On most grazing sticks, there is an “Estimated Air-dry Weight” table that provides vegetation quantities in pounds per inch of height for various forage types. Grazing sticks are regionalized and contain only information applicable to the geographical area for which they are designed. The author’s measuring stick, designed for East Texas, contains the information shown in the table. In using this table, one must determine the vegetation stand condition by estimating percent cover. To estimate percent stand cover, look down into the forage from above to get a feel for how much area is covered by vegetation. Record measured leaf heights and estimated stand conditions from across the pasture and average the resulting numbers. Assume the vegetation is native warm-season forage, its average height is 15 inches, and the average stand condition is between good and excellent. The table shows that available forage on this site is 200 pounds per inch or 3,000 pounds per acre (15 x 200 = 3,000). Carrying capacity is the average number of animals a pasture can support over time. Stocking rate is the number of animals grazed on a pasture for a given amount of time and ideally should be adjusted for current conditions. When stocking rate exceeds the carrying capacity, pasture condition and its ability to produce forage declines. The rule of thumb for grazing native vegetation is to “take half – leave half.” Fifty percent of the vegetation is left ungrazed with enough foliage and roots for regrowth. Twenty-five percent is lost to trampling, urination, and defecation, so the cow is allowed to consume 25 percent of the forage. A cow will eat approximately 3 percent of its body weight daily. The total AUY for 105 cows weighing approximately 1,300 pounds each is 136.5 (105 x 1.3). A herd of this size requires at least four bulls. If it is assumed that the bulls weigh an average of 1,800 pounds, they add 7.2 AUYs (1.8 AUYs each) or the equivalent of six 1,300-pound cows, which brings the carrying capacity of our ranch down to 99 cow-calf pairs and four bulls. The rancher decides to retain the entire calf crop to sell into the grass-fed market. From our 99-cow herd, we assume an 85 percent calving rate resulting in 42 heifers and 42 steers. Calves are weaned at an average of 500 pounds and are expected to gain 1.5 pounds per day for 333 days. Taking the midpoint weaning weight of 250 pounds and projecting that forward to a 1,000-pound finish weight, Carpenter figured AUs at 0.75 (750 pounds divided by 1,000 pounds per AU). Carpenter multiplied 0.75 AU by 333 grazing days to obtain 250 AUDs. Two hundred and fifty divided by 365 days in a year equals 0.7 AUY. Eighty-four stockers (grass-fed calves) at 0.7 AUY each equates to a total of 59 AUYs. If grass-fed calves will add 59 AUYs to the grazing pressure, a reduction of 45 cows is required to avoid overuse of the pasture (59 divided by 1.3). The remaining herd of 54 cows delivers 46 calves at 85 percent calving rate. The rancher decides to use 11 of the heifers as herd replacements and grass-feed the remaining 35. Thirty-five calves times 0.7 AUY gives a total of 25 AUYs. Total AUYs for the ranch are now: 70 AUYs (54 cows) + 7 (4 bulls) + 25 (35 stockers) = 102. Since the cow herd is now 54 cows, only two bulls are needed, which reduces stocking rate by 3.6 AUYs. After selling two bulls, the stocking rate is 98 AUYs with a carrying capacity of 105 AUYs. Available carrying capacity allows the addition of 7 AUYs. The above calculations are presented as examples of the thought process required to develop a business plan for a grass-feeding enterprise. Animals must be managed in a manner to promote optimum forage growth; otherwise, the business will not succeed. Monitor forage supply regularly and adjust AUs to the available supply. This article appeared in the January 2018 issue of Hay & Forage Grower on pages 14 and 15.